Impara, prepara e assapora le delizie culinarie di una delle cucine più antiche, storiche e deliziose d'Italia. Crea due piatti tradizionali napoletani: gnocchi alla sorrentina e spaghetti con vongole e prezzemolo o un piatto di pasta alternativo con verdure. 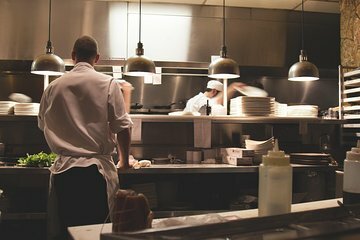 Pratica le tecniche di cucina locale con uno chef di zona e siediti per assaggiare i risultati. Andrai via con un nuovo apprezzamento dei cibi classici e deliziosi di Napoli. I gained a new appreciation for Naples. The roads were closed to our original location. The tour operator arranged for a new location in a restaurant where we were cooking in one of two restaurant kitchens which was very nice and they gave us a brief tour of the city. This was awesome. From the port where cruise ships dock, it is about a 40 minute ride in the included van. For us, our van driver spoke multiple languages, was a former tour guide, and gave lots of great information during the drive. So even the part that should have been boring was enjoyable. The cooking was a lot of fun. All of the food turned out great, and we learned some fun things. The biggest perk to this activity is the scenery. I cannot stress how wonderful the view is. We ate outdoors on a patio with vines as a roof, overlooking the ocean, Napoli, and many of the surrounding cities.